LG announced before that they were working on a smartphone with a curved screen, the device, called the LG G Flex, has been leaked all over the internet since then and now, LG has finally decided to make things official. The company recently announced its LG G Flex that comes with a 6” 720p display that has an arc from top to bottom, unlike Samsung’s Galaxy Round that is curved from side to side. The G Flex is powered by a 2.26GHz quad-core Snapdragon 800 processor with 2GB of RAM on board. Measuring between 7.9 and 8.7mm thick at various points, it comes with a 13MP camera on board, rear buttons similar to the G2, and has a 3,500mAh battery on board. But what makes the phone different isn’t only the design that is touted to offer better ergonomics when making a phone call, it has a “self-repairing” back cover that can repair scratches in the matter of minutes, perhaps something similar to what Nissan announced over a year ago? Other specs include high-fidelity audio recording and playback, dual-window app functionality and tap-to-wake found on the G2; there’s also a special animation that changes depending on where and how you unlock the device. As for the new design, it’s sad to say that LG did not mention on what else the curved design could offer, you know, like what Samsung announced with the Galaxy Round. 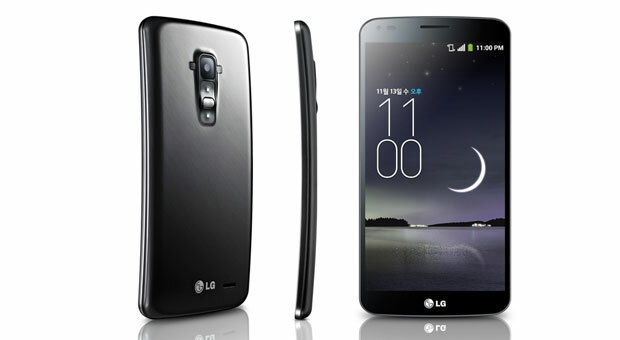 The LG G Flex will arrive on Korea’s three major carriers next month. Nokia World & Apple Special! We Discuss The Big Events This Week!